Walkers can now set off on a long-distance route on a firmer footing with the opening of a new bridge. The footbridge at St Bees, at the start of Wainwright’s Coast to Coast Walk, replaces one swept away in the floods of June 2012. The route is used by thousands of walkers every year as they embark on the 309km (192-mile) Alfred Wainwright-devised walk that starts on the Cumbrian coast and ends in Robin Hood’s Bay in North Yorkshire. The old bridge was washed away in the same week 829 walkers used the old structure in a single day. The new bridge also provides access to St Bees Head from the resort of St Bees. Derek Cockell of the Wainwright Society said: “The Wainwright Society is delighted to learn that the bridge over Rottington Beck at the start of the Coast to Coast Walk has been replaced in time for the 2013 Coast to Coast walking season. 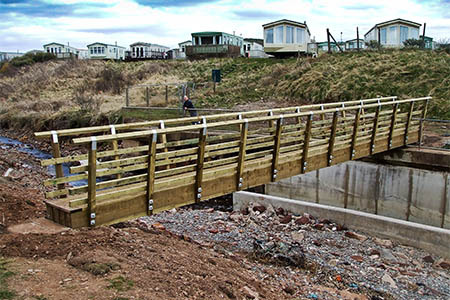 The bridge was installed by Cumbria County Council through a partnership involving the landowners the Royal Society for the Protection of Birds, Natural England, Copeland Borough Council, local councillors, St Bees Parish Council and the owners of nearby Seacote Caravan Park. The restoration was part of a wider scheme run with the Lake District national park and funded by the Rural Development Programme for England in response to the June 2012 flooding in Cumbria. Good to see the new bridge erected, and good to see this publicity. This traffic count must make it one of the busiest footpaths in Cumbria. You can see more about St Bees on the extensive village website. but there are over 400 opages and 600 images on the site on many topics, so have a browse to find out more about this interesting coastal village.